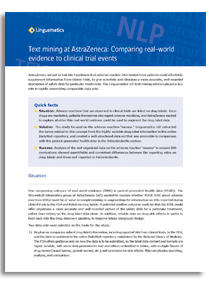 AstraZeneca set out to test the hypothesis that Real-World Evidence (RWE) adverse reaction information from patients could effectively supplement information from clinical trials, to give scientists and clinicians a more accurate, well-rounded description of safety data for particular treatments. The Linguamatics I2E text-mining solution played a key role in rapidly assembling comparable data sets. Download the full case study, or access the webinar. You can also read more in our blog.